If you have a little free time on your hands, Swagbucks is an easy way to get free gift cards, cash or even a donation towards your favorite charity. Completing simple tasks like watching videos, installing apps, and filling out surveys, will get you points that can be redeemed for these rewards. This Swagbucks review will show you what is Swagbucks and how it works. Firstly, it will show you how to use Swagbucks. I’ll then address the most common questions associated with Swagbucks and finally, my top tips for using Swagbucks to get the maximum earn rate. You’ll also get a $5 Free Swagbucks code for getting started with Swagbucks if you sign up using this link: Join Swagbucks Today. What is Swagbucks and How Does it Work? Swagbucks is an online rewards website with a presence in the U.S, Ireland, U.K., Australia and Canada. Swagbucks pays it’s users in points called SB (we’ll call them SB from here on in) for doing simple tasks like answering surveys, a daily poll, watching videos or using its search toolbar. That’s right, you can earn free gift cards online by collecting points called SB just for running your internet searches through Swagbucks. They also have coupons and cash back available which allows you to earn more SB. Follow the steps below to get started and make the most out of your time on Swagbucks—and have some fun, too! Top Tip: Make sure you sign up to Swagbucks before clicking any of the links below, then remain signed in. That way, the links below will take you to the correct areas of the Swagbucks site. After you’ve created your account and confirmed your email, you can dive into Swagbucks’ Daily To Do List. Don’t forget about your daily goal meter! If you hit your first goal, you’ll get a bonus, and your goal will steadily increase. Hitting your first goal every day for a week will result in a Winning Streak, and if you keep it going, you can earn up to 300 SB. Not every search is a winner, but if you’re lucky, you’ll see a Swagbucks symbol over your results and receive between 1 and 100 SB. It’s as simple as it sounds: play videos with Swagbucks Watch and earn SB. Choose your favorite category and earn up to 500 SB per day. Get SB for sharing your views through Swagbucks’ Survey Section. Even if you’re disqualified after the first few preliminary questions, you’ll still earn 1 SB for your time. Just one of the many games available on Swagbucks. Trying to beat your high score on free games like Swag Jump, Swag Memory, and Swagasaurus Run is a fun way to meet your daily goal. If you typically pay to play online games, there’re many options to earn SB by doing that through Swagbucks as well. Earn SB for every qualifying purchase you make from selected brands. It’s also helpful to install SwagButton, a free browser extension that provides relevant coupons and notifies you if you’re visiting a website that offers cash back with Swagbucks. These can be found by navigating to the Discover section and scrolling down the sidebar. Swagbucks’ partners provide a wide selection of free one-click offers, interesting surveys, and paid trials. Check out the Install & Earn section to earn SB in exchange for downloading games, music and video streaming services, and even ride-sharing apps. Swag Codes are time-sensitive, one-use promotional codes that are periodically hidden throughout the Swagbucks network. Once spotted on Swagbucks.com, Swagbucks’ social media channels, or the Swagbucks newsletter or blog, they can be redeemed for SB on the Swagbucks homepage next to the search bar. The Swagbucks Toolbar is an effortless way to earn SB. The initial download pays 50 SB, and simply leaving this extension on your browser will get you 1 SB per day. Every Swagbucks user has their own unique referral link, and you can find yours here. If your friends sign up using your link, you’ll get 10% of their earnings for life. The more people who sign up using your link, the more SB you’ll get, so spread the word! How many Swagbucks equals a dollar? 100 SB = $1. Whether you decide to spend your earnings on e-gift cards or donations or convert them into cash, 100 SB are always equivalent to $1. Swagbucks does offer an ever-changing selection of discounted rewards, though. Don’t forget, you need to be logged into Swagbucks to access these links. Join for free with this link and you’ll receive a $5 sign-up bonus: Join Swagbucks Today. The cheapest e-gift card available in the Swagbucks Rewards Store goes for $1, but it pays to save up: your first $25 gift card redemption of each month is automatically discounted by 12%. After choosing a prize and clicking the verification link that will arrive in your inbox, it will take between 7 and 10 days for Swagbucks to process your reward. You’ll get a second email when it’s available to access on their website. Get rewarded for giving back! Depending on which charity you choose, you could earn up to 16,000 SB. Swagbucks is currently partnering with the American Red Cross, the ASPCA, Child Fund International, the Conquer Cancer Foundation, Feeding America, the Mercy Corps, the Nature Conservancy, the Sierra Club, the UN Refugee Agency, and the WWF, and they plan to team up with more organizations soon. Although Swagbucks does not send checks or hard cash, it is possible to convert Swagbucks to PayPal, which can easily and securely transfer money directly to your bank account. Many of the rules that apply to the other rewards go out the window when it comes to PayPal, though. It takes extra SB to redeem a PayPal reward depending on the amount you choose (the minimum is $5), and it may take up to 21 days for your earnings to arrive, but it’s worth it to be able to pay for gas or rent with earnings from Swagbucks. Is Swagbucks legit and safe to use? It’s completely legal and safe to use Swagbucks. I totally get why some people wonder is Swagbucks a scam because it seems too good to be true that you could earn gift cards online from answering a few questions from the comfort of your home. Some users have noted that it could become addictive chasing SB’s and I can see how that might happen if you were into games and played a lot of them via Swagbucks. Perhaps the most important question of all – is Swagbucks worth it?. Only you can answer this. If you need to get gift cards to pay for Christmas gifts or for a special occasion, and you have a lot of free time on your hands, then Swagbucks can be a great way to fill your time and get free gift cards online. If you work a full-time job and you have a side hustle that earns you a lot of money, chasing SB might not be worth your time. That said, running internet searches through the Swagbucks toolbar and playing games on the website every so often something most busy people can manage. I’ve heard of people running Swagbucks TV on their laptops whilst they get ready for work in the morning, or while doing the washing up. This can be a great way to earn gift cards online without taking up more valuable time. Let me be clear here, Swagbucks is not a replacement for your regular income, rather earning gift cards online by redeeming SB is a complement to your income. This is cherry-on-top money, people. BUT, if you’re between jobs and have a lot of time on your hands, you could spend hours on Swagbucks to increase your balance. Depending on how good you are at multi-tasking you could run several monitors in order to answer surveys on one screen whilst running videos on another. I’m still not sure it’s worthwhile as you’ll never earn as much as you would in a regular job or if you were to start a side hustle, but a few extra gift cards are definitely attainable. Follow Swagbucks on Facebook to hear about special offers and opportunities to earn extra SB. Reading the Swagbucks blog is a great way to earn extra SB. They often release Swagcodes for you to increase your balance, or run challenges that equal extra SB if you complete the tasks. Offers and opportunities to earn more SB are regularly posted to your Swagbucks inbox. Surveys that are targeted to you (meaning you’re more likely to qualify for them) will be sent to your inbox. To check your inbox, click the envelope icon in the top bar of the site. Swagbucks search is run via the Yahoo search engine, so you can be assured of quality results. Setting Swagbucks as your default search means you’ll never miss out on the opportunity to earn extra SB. Here are the instructions for defaulting your search to Swagbucks. Swagbucks can be a great way to boost your savings for Christmas or a way of earning residual income. It’s not going to make you rich, but you can earn gift cards online from the comfort of your home, whenever you have the time available. It’s the perfect complement to other income-boosting strategies, yet it requires very little effort. In my opinion, you should definitely check out Swagbucks to see if it’s right for you. Don’t forget to use this link when you sign up to get your free sign up bonus: Yes, I want to try Swagbucks. 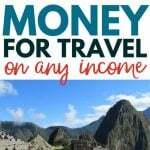 15 Ways to Make Money Online Internationally - Work Online and Travel! I’ve used Swagbucks a couple time before. It’s really easy to acquire points and I also think it’s much more organized than other sites of similar stature.